ADA compliance is a big deal in commercial construction, but more of an add-on in residential. If the particular homeowner needs it, Universal Design is 'added' in to the process. But some designers and builders build Universal Design into everything they do. Those who do it well have found that there are some fairly simple ways to make rooms work better for all who use it, and customers usually like it whether they need it or not. Yet. Kitchens and bathrooms are two particularly important rooms for accessibility/inclusiveness because important work gets done in those rooms. They are also slippery rooms with a lot of hard surfaces, so they are inherently more dangerous. We looked at kitchens earlier this year and will begin bathrooms today, focusing on design choices that can make bathrooms easier on youngsters, oldsters, and in-between-ers. With some help from peeps who tweet, I've put together a short list of inclusive design elements. This is by no means an exhaustive list. 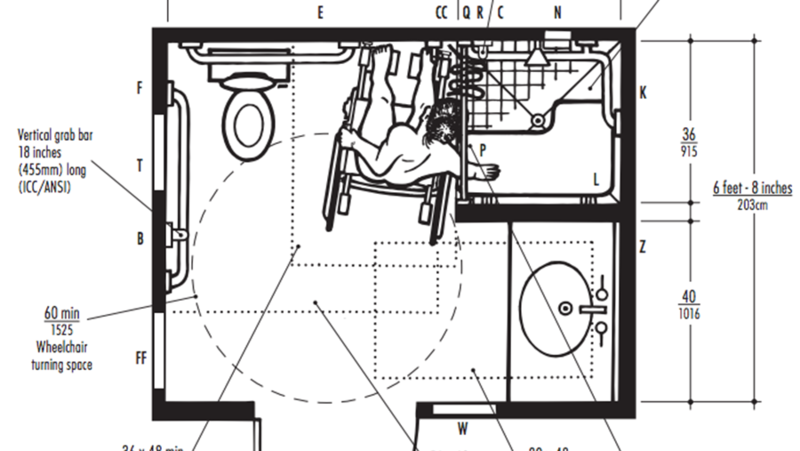 For a lot more on accessible design, see the sources at the bottom of this page. As I said, bathrooms are slippery and tubs, sinks, toilets, and tile are hard. The two make bathrooms potentially dangerous for most people who enter. There are a lot of good-looking, non-institutional grab bars for bathrooms. One of our sponsors, Bestbath, has an article about them here on ProTradeCraft. There are other companies that have them, too. Step one for grab bars is solid blocking. If space permits, you can skin the inside of a wall with 3/4 inch plywood to make future grab bars easy to place. If you don't have the extra 3/4 inch, recess blocking between the studs in critical locations. You can also get suction-cup grab bars. Showers are more accessible than tubs are to older folks and people with wheels. A channel drain forces a gentle, even slope and a flatter, easier-to-navigate floor. According to Kohler, a 'Comfort Height' toilet is "approximately 2 inches taller than traditional toilets," American Standard calls them 'Right Height' toilets; they are about the same height as a chair, 16 to 17 inches above the floor. Seats that are 17-19 inches above the floor are easier for older peeps to sit on and stand from. Centering the toilet 18 inches from the side wall makes enough space to comfortably install grab bars. The image above also shows grab bars that double as towel bars and toilet paper dispensers. Noice! A hand-held shower spray on a sliding vertical bar allows people to set the shower head to the right spot for almost anyone. A 60 inch hose allows the shower head to be used while seated and it makes cleaning the shower much easier. While it is good to have grab bars, it is also good not to slip in the first place. This important safety feature is easily overlooked, can claim the tailbone of anyone, and extends from the bathroom floor to the shower and tub. Some people do not have the endurance to stand for whole showers, or need to sit for other reasons. Fold-down seats are one option for showers with limited space. Tubs can have benches that span both sides. Durable, beautiful wooden benches are a great upgrade if the shower is roomy enough. By sliding sideways into a wall, the door will never swing toward people with wheelchairs or walkers.